I’m not much of a curry chef. I’ve always (mistakenly) thought they were really labour intensive. 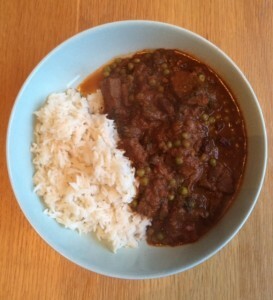 Turns out I was wrong – this beef madras is easy to make and the kind of thing you can leave cooking whilst you get on with other things, plus you can put a whole host of vegetables in it. Chop onion and garlic and gently cook in a little beef dripping. Cut beef into strips/chunks and add to the pan, browning gently. Mix together all of the spice powders and add to the pan, stirring to ensure meat is fully coated. Add tomatoes and water, stir thoroughly and then bring to the boil. When the mix is boiling, reduce to a simmer and leave for 2-3 hours, stirring occasionally. Around 3 minutes before serving, add the spinach, peas and raisins and stir into the curry. Serve the madras with boiled basmati rice. Strictly speaking, madras is supposed to have ginger in and the spinach, peas and raisins aren’t exactly true to tradition, but in my eyes recipes are just a guideline so I personalised it a little. That, plus a madras curry is an excellent way to add extra vegetables to a meal so I took advantage and added spinach and peas to my madras recipe. This madras is low fat (only fat used is to cook the beef and onions), high protein and contains 4 servings of vegetables and a serving of fruit so ticks all of the health boxes. If you were watching your carb intake, serve with a portion of vegetables instead of the boiled white rice. By the way, I’ve now started a VIP email list with discounts, offers, tips and news. You can subscribe at on my homepage! Click here to sign up (blue box at the bottom).